Manufactured by Duro Manufacturing Inc. 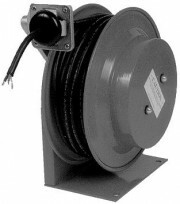 Heavy-duty with 45 AMP rating collector ring with 6 foot inlet cable to match working cable. Spring operated reel for live electricity. All steel construction with powder coat finish. The cable guide arm adjusts for ceiling, wall or floor.